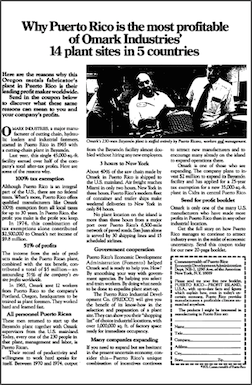 Here is another ad in the Commonwealth of Puerto Rico Series — perhaps one of the most effective business development advertising campaigns ever devised. Here are the reasons why this Oregon metals fabricator’s plant in Puerto Rico is their leading profit maker worldwide. Send in the coupon below to discover what these same reasons can mean to you and your company’s profits. OMARK INDUSTRIES, a major manufacturer of cutting chain, hydraulic loaders and industrial fasteners, started in Puerto Rico in 1965 with a cutting-chain plant in Bayamon. Last year, this single 45,000-sq.-ft. facility earned over half of the company’s total after-tax profits. Here are some of the reasons why. Why do some ads hit the white hot center of a market and become the control ads remembered years later, while others fall by the wayside? This long running ad from the child psychology market sheds some light. He went from the Downtown comedy clubs to the hallowed halls of the J. Walter Thompson ad agency. He started by writing ads and followed his mentor, James Patterson, into the world of writing mysteries, becoming an advertising creative director along the way. He’s mystery writer, copywriter, screenplay writer, creative director, improvisational comedian and now children’s book author, Chris Grabenstein, that’s who. How has Chris been able to achieve so much in so many different areas? Chris shares over 30 years worth of strategies for succeeding in the world of advertising and fiction, attention getting communication and winning productivity habits.